On the chess board , wazir is the most dangerous opponent . It can literally make and break a game . 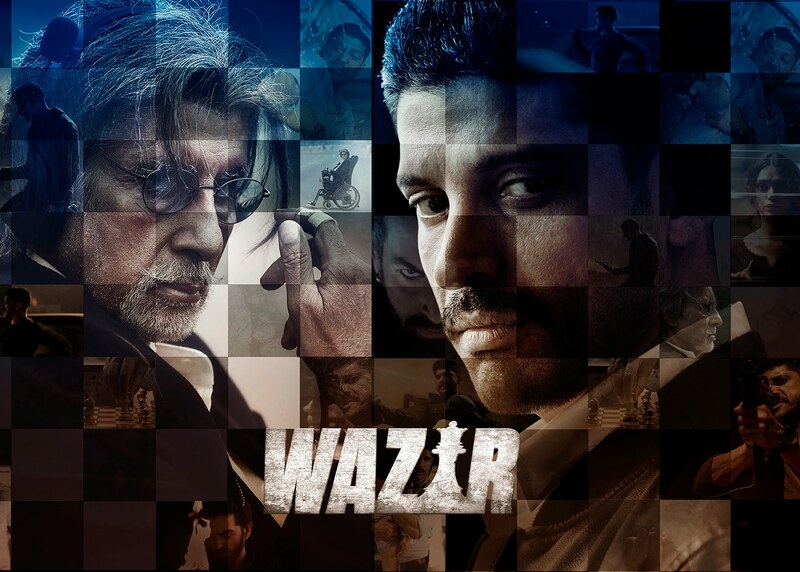 So in a movie where the main protagonists play chess , it is ideal that the villain who breaks lives should be called wazir , isn’t it ?? So in this movie anti terrorism officer Daanish Ali ( Farhan Akhtar ) has to confront the villain wazir ( Neil Nitin Mukesh ) , who is playing havoc with his friend Pandit Omkarnath Dhar’s ( Amitabh Bachchan ) life . How he comes to the confrontation is a convoluted tale in itself…. Danish loses his daughter in a gunfight with terrorists from Pakistan , and his crusade for revenge costs him his job , for he is suspended . But his loss is far worse , because he also is now reviled by his wife ( Aditi Rao Hydari ) because he involved his daughter in an anti terrorist gunfight . By coincidence he comes into contact with Omkarnath , who bonds with him over games of chess and tells him of his own daughter’s death in mysterious circumstances at the home of a Kashmiri politician . Danish decides to confront the politician and the politician responds by sending a person to terrorize Omkarnath—who else but wazir…. So who is this mysterious entity called wazir ? What is the mystery of the death of Omkarnath’s daughter ? Is the kashmiri politician guilty ? Will Danish be able to uncover the truth ? Watch the movie for the answers…. The movie has a powerful start with good action sequences , but drags in the middle—until the appearance of wazir….then again the movie picks up pace as wazir ignites the proceedings…. But there are too many coincidences in the film , and many of the happenings appear way too filmy because they are too convenient for the storyline to proceed . You lose interest in some parts , though other parts of the film are interesting . The movie moves from Delhi to the flashpoint of the subcontinent—Kashmir what else , where the final fight takes place . But we are left with a real surprise in the end….yes , it is the end that packs the real punch and injects much needed zing to the movie . And what happens at the end ? Well I am not about to reveal that…. But it is the climax that makes you feel that the movie is good . The photography is decent , but no great shots are shown . Actually Kashmir in winter would have made the perfect setting for great photography , but the director was more concerned about action . Background music is okay . But the songs are very good , and after some time an action/suspense movie had good songs . Some of them are worth listening again and again . Acting is okay from everyone , and as usual Amitabh steals the honours . Aditi Rao Hydari looks stunningly delicate and fair and so lovely—she would be the ideal model for ‘fair and lovely’ cream !! Her flowing dresses have been wonderfully designed . The theme of the movie is chess , and the player who uses wazir for achieving his goal is a deft player on the chess board . But this is the deadly chess board of life and death , and wrong use of the wazir can have fatal consequences indeed….